I'm hoping that people are having a good holiday weekend; we visited family Thursday, I went to The Source on Friday, and yesterday and today I'm in the game room getting the old place cleaned up. I'm expecting visitors next Sunday, after the game session, and I thought it would be nice if we could actually get into the game room. The new video rack has, after lots of sweat and straining, been moved into the video alcove to replace the old systems and all I have to do now is clean up after myself. The 'short trip' to The Source turned into a seven hour jaunt, which was just heaps of fun; I got to talk to gamers about gaming, without any of the 'Serious Gamer' attitude that I've run into recently. Just a lot of folks talking to me about my time in gaming and how I game; I also got to talk to Tim Erickson of TRE Games for quite a while, which is always fun and informative. Besides picking up stuff (comics and some board games) for The Daughter-In-Residence, I was picking up some more Romans for the 'Cleopatra Braunstein' that I'm building - I really must come up with a better name for that game! - and in the budget discussions with She Who Must Be Obeyed I was informed that I could have my Romans if she could have some Macedonians. Huh? Run that one past me again? Yep; the Missus hasn't played games in years - due to her health issues, really - but she does maintain a lovely interest in the goings-on in the game room. 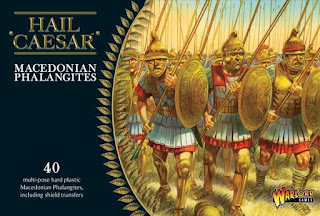 So, in a move that caught me by surprise, she's funding some 80 more Macedonians (A box of 40 as seen above, and a box of 40 Warlord Spartans so we can say we've got some Greek mercenaries in the game) for the various Egyptian players to plot against, bribe, suborn, coerce, and generally carry on in the usual Braunstein manner. Gold coins courtesy of a party shop; look in their 'pirate party' section for bags o' loot. So, I'll paint these up fo her, and I think I'll have fun doing so. The Macedonians are all rank-and-file figures, so I'll have to dig around in the parts boxes for arms to make the command figures; same for the Spartans - what I think is interesting about this box is that it is the 'generic Greek hoplite' sprues with additional 'Spartan Upgrade Sprues' with the different heads and some cast metal accessories. The three boxes of Romans are the 'Legionaries' and 'Veterans' we've reported on before, and a box of the 'Caesarian' Romans. I first saw this movie decades ago, and I've always wanted to put the attack on the Moon Gate on the table. I'm still dithering over what to do with the Roman archers I got a long time ago to use as Salarvyani; I have plenty of archers for them, thanks to the Celtos line and various historicals, so I think I'll transfer those Foundry 'Eastern Archers' back to the legions - and finally finish painting them, too! And I will say that as Howard Fielding, he of The Tekumel Project, goes from strength to strength, I'm getting less and less inclined to be satisfied using all sorts of odds and ends of historical figures in my Tekumelyani forces. I'll keep the ones that I bought specifically for them and have painted up where they've serves so well for some forty years, but all the unpainted and half-painted figures that I've bought 'on spec' are going to get a new posting and get into action. I am having heaps of fun, like I had back in the day, and really enjoying my new lease on gaming. Oh joy. You now reminded me that I have said to the wife she really must watch that classic film with me. Now I got to make it happen! I'd love to play a game with scene from that movie. Well, we thought that it was worth the time to watch; I would suggest using the intermission to get a snack, as it is a pretty long movie - four hours, maybe? On the other hand, it's just chock-full of possibilities for gaming, bit for miniatures campaigns and role-playing ones. The attack on the Moon Gate is my favorite, but Actium - especially that nice little cutter Antony gets around in - is also a favorite.